In 1920, following a public appeal which raised over £14000, the War Memorial Committee of Hyde Borough Council made a momentuous decision by purchasing Lower Higham Farm and all its land. Following the purchase a scheme was put forward to protect the land forever for the health and well being of the community, a lasting tribute to the 710 men from this area who perished in the Great War of 1914 to 1918. On the site known as Hackingknife, at a cost of £2000, Hyde’s main war memorial was officially unveiled on the 25th June 1921. The land and farm are now held in trust by the Hyde War Memorial Trust. SUNDAY 11TH NOVEMBER 2012, AT 12 NOON. The main service and wreath laying will be held at the Cenotaph, followed by wreath laying and prayers at the Memorial Garden near to the Visitors Centre. There will be access for vehicles up to the Cenotaph, if necessary. Light refreshments may be obtained at the Visitors Centre. 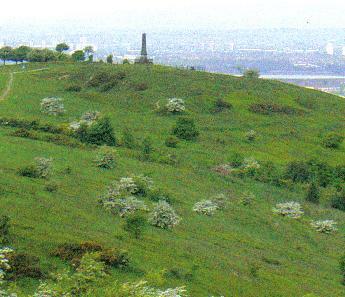 The 710 men of the old Borough of Hyde who gave their lives in the 1st World War, were remembered at the Peace Day Service held at the Cenotaph on Werneth Low, on Sunday 26th June 2011. Remembered too were men and women across Tameside who lost their lives in later conflicts, and those currently engaged in active service in Afghanistan. The service was led by Rev Richard Lamey, Rural Dean of Mottram & Priest in Charge of St.Mary’s, Newton in Mottram. The Deputy Mayor Elect (Councillor Joe Kitchen), and Deputy Mayoress Elect (Mrs Shirley Kitchen),The Royal British Legion, St.John’s Mossley Band, and other groups and organisations, attended the occasion, and wreaths were laid. The Hyde War Memorial Trustees and the Country Park Rangers consider it a great honour to remember all those men and women who have given their lives in all conflicts in order to bring freedom.